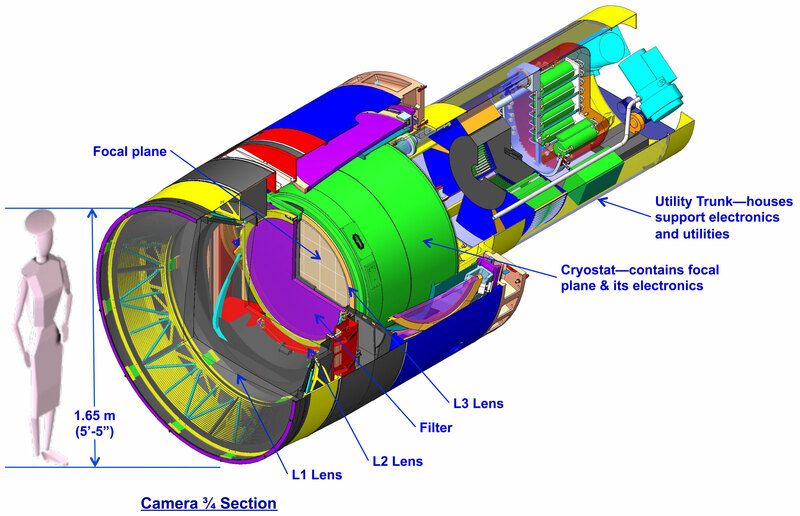 A schematic of the LSST camera. Note the size comparison; the camera will be the size of a small SUV. The LSST camera is the largest digital camera ever constructed. At about 5.5 ft (1.65 m) by 9.8 ft (3 m), it's roughly the size of a small car and weighs almost 6200 lbs (2800 kg). It is a large-aperture, wide-field optical imager capable of viewing light from the near ultraviolet to near infrared (0.3-1 μm) wavelengths. The camera is designed to provide a 3.5-degree field of view, with its 10 μm pixels capable of 0.2 arcsecond sampling for optimized pixel sensitivity vs pixel resolution. The image surface is flat with a diameter of approximately 25.2 in (64 cm). The detector format employs a mosaic of 189 16-megapixel silicon detectors arranged on 21 "rafts" to provide a total of about 3.2 gigapixels. The camera includes a filter-changing mechanism and shutter. It is positioned in the middle of the telescope where cross sectional area is constrained by optical vignetting (edge darkening) and heat dissipation must be controlled to limit lens-deforming thermal gradients in the incoming light. The LSST camera will produce data of extremely high quality with minimal downtime and maintenance. Animations showing how the camera's shutters work (L) and how the filter-changing mechanism can robotically change camera filters (R).